SEATTLE – I come to you today slightly puzzled, which, granted, is not an uncommon state of mind for me. The subject this time is Jake Browning. The Washington quarterback is in the midst of spring camp prior to his fourth year as the Huskies starting quarterback. He’s become a fixture in the program. He was the Pac-12 Offensive Player of the Year as a sophomore. By the time he leaves, Browning will likely own every school passing record in the book. He will have presided over one of the most successful runs in UW football history. Browning is safely in Husky Hall of Fame, retired uniform number, all-time legend territory. And yet, far more than I expect, I hear criticism and reservation from Husky fans when Browning is discussed. And I don’t quite get it. Oh, I recognize that criticism comes with the territory for the quarterback of a high-profile team, and Browning is certainly not above reproach. Few fan bases at any level are ever fully satisfied with their quarterback. I recognize even more that in today’s world of anonymous armchair rip-job cowboys on message boards, article comment sections, and social media, it’s possible to get a skewed view of the public consensus. It’s not that Browning love is nonexistent, by any means. And yet I still think I’m hearing way more than I expect about Browning’s limitations, and not as much about his accomplishments. This is just me, but I believe Browning is being short-changed a bit for what has been a highly successful tenure. Part of it, I’m sure, is the presence of two highly touted, heavily recruited incoming freshmen who will vie for the backup job, along with redshirt freshman Jake Haener. Any time there is new blood at that position, especially as accomplished as Jacob Sirmon and Colson Yankoff were in high school, it titillates the mind with possibilities. And you can add to that the unique addition of five-star transfer Jacob Eason, who will redshirt this year after leaving Georgia. The juxtaposition in camp of the 6-foot-5, 235-pound Eason, an NFL prototype if there ever were one, with the physically unimposing Browning, is jarring. Just in practice, you can see Eason making throws that Browning can’t. However, what Browning does have is an impeccable knowledge of Chris Petersen’s offense and a proven ability to execute it. He already has the most touchdown passes in school history with 78, having surpassed Keith Price’s previous record of 75. He has 9,104 passing yards, which has moved him past Price into No. 2 on the all-time list, 812 yards behind Cody Pickett’s 9,916. Barring injury, that will go down in the first half of the season. What separates Browning from Price and Pickett is that the Huskies are 29-11 in his three years as the starter, with an appearance in the national semifinals against Alabama as a sophomore and the Fiesta Bowl against Penn State as a junior, although both were losses. The Huskies went 23-16 under Price from 2010-13, and 21-16 under Pickett from 2001-03. 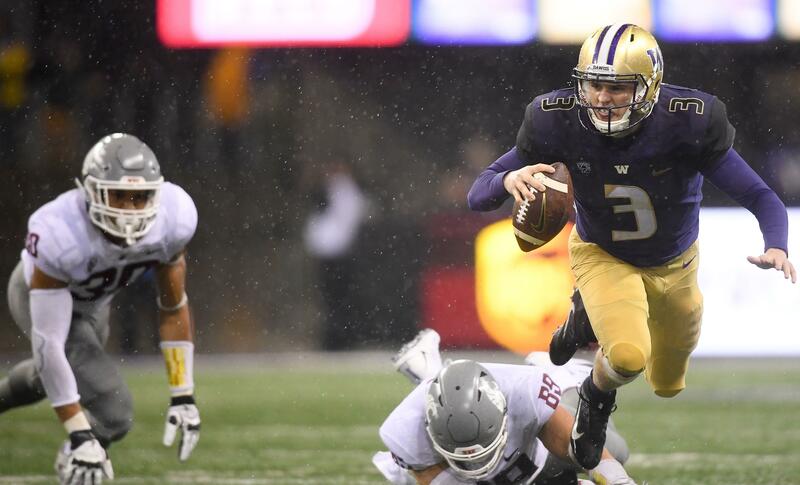 Those UW teams were battling for a middling bowl game; the Huskies under Browning have had legitimate opportunities to make a national mark. It is Browning’s failure to lead the Huskies to victory in those bowl games, as well as the subpar effort in losses against USC as a sophomore and Arizona State as a junior, that no doubt is the genesis of much of the skepticism. But Browning has also shined in big games, including a 21-for-29 effort that yielded three touchdowns and 292 yards in a 45-17 Apple Cup win over Washington State in 2016, a game the Huskies needed to win to clinch the Northern Division title. And his six-touchdown performance in the 70-21 victory over Oregon that season that ended the Huskies’ long drought against the Ducks was epic. But there is also a sense of regression by Browning from 2016, when he passed for 3,430 yards and 43 touchdowns, to 2017, when he passed for 2,719 yards and 19 touchdowns. Now Browning has a chance to definitively alter the narrative with a stellar senior year. It may hinge on whether he can lead them to victory over Auburn in the opener in Atlanta, which would put the Huskies squarely in national playoff contention. Considering the Pac-12’s flagging reputation, a loss might effectively sink those hopes. After the Huskies’ first practice last week, Browning was asked if he embraced the role as a “grizzled veteran” of mentoring the younger quarterbacks. With the strong core that the Huskies have returning – including fellow four-year starter at running back, Myles Gaskin – the opportunity is right there in front of Browning to have a monumental senior year. The potential is always there for disappointment as well. But before we see which way it goes, it seems worthwhile to remember that Browning has already put together a resume that compares favorably to any UW quarterback, any time. Published: April 5, 2018, 7:46 p.m. Updated: April 5, 2018, 4:29 p.m.